Russian star Artyom Dervoed's debut concert in Victoria! In program: Paganini, Tedesco, Rodrigo, Callahan. Universe Guitare (France) has famously dubbed Artyom Dervoed the “Tsar of the guitar”. This bold claim is backed by the growing international demand, an active recording career, and no less than 16 first place awards in various international competitions. A regular guest on the world’s most prestigious stages, including the Berliner Philharmonie, Kölner Philharmonie, Tonhalle Düsseldorf, Carnegie Hall, Jordan Hall, Bunka Kaikan, and Great Hall of the Moscow Conservatory, Mr. Dervoed is among the most eminent champions of the classical guitar. 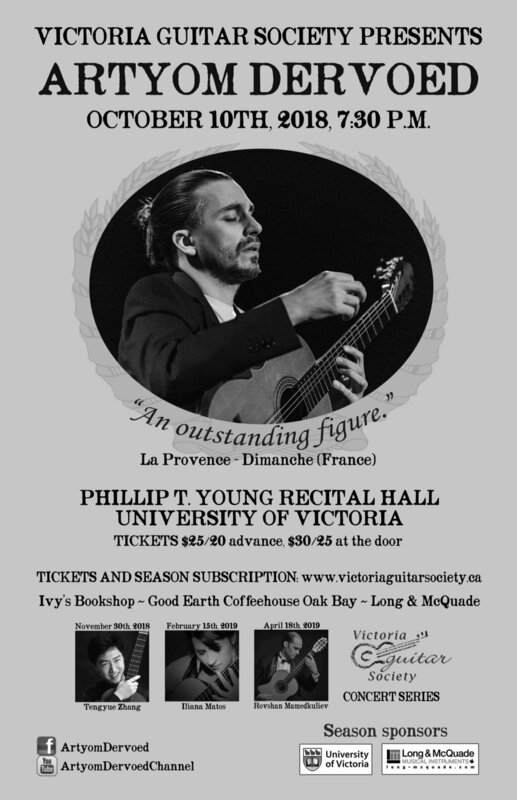 Having mastered the entire standard orchestral, chamber and solo guitar literature, he is significantly expanding the existing repertoire through collaborations with leading composers, whose works he inspires, commissions and performs. Day of the concert is the last day of the season subscription sale (4 concerts) for $95 general/75 student or senior. Advance tickets are available online and the following locations: Long & McQuade, Good Earth Coffeehouse Oak Bay, Ivy's Bookshop.